Why EOS should change their attitude. Blog / Why EOS should change their attitude. EOS has made waves as it splashed into the blockchain. But EOS still presents one huge problem — a closed community with little support for developers. MyWish has become the first Smart Contract Platform to create a security service for the EOS Blockchain. When EOS presented its own blockchain in June 2018, it didn’t come without struggles. From the complicated process of creating an account on the EOS blockchain to the large sum attached to it, there were quite a few problems. Believers in EOS who envision a future on the blockchain met opposition from the EOS team’s silent approach. In terms of community, EOS has gone for a closed approach. Messages go unanswered. EOS does no work to encourage the public to use its service. In spite of this, developers continue to embrace the platform and support the EOS platform with little to no praise or support. EOS remains a frigid parent, and developers are left to flounder without any real sense of community. No to Yellow Paper. EOS is a revolutionary new blockchain which must not be compared to Ethereum or Bitcoin. Due to the lack of EOS’s Yellow Paper, which is responsible for the detailed technical characteristics, it is really hard to figure out how it works. This also results in presence of dubious information and guesses. No to time saving. The EOS blockchain has one of the most complex technical stacks (it’s a programming language, a framework and the set of tools). It could significantly ease the process of facilitation if EOS prepared a yellow paper for their devoted developers. No to stability. EOS is in the midst of developing. This is the time for active code refactoring after the MVP phase. This causes many bugs and commits which impede the integration. No to proofed scripts. A compiler for smart contract code which transforms computer code written in one programming language into another WebAssembly bytecode is a way broken with EOS. They have many mistakes in their scripts which prevent the code’s transformation. No to reliability of the nodes. The EOS approach towards the state system (it is designed to remember actual blockchain state) leads to a temporary disability of the platform for at least 4 hours, but it can ast even up to 8 hours. MyWish implemented a couple of additional nodes ourselves to protect the platform. Enter MyWish. 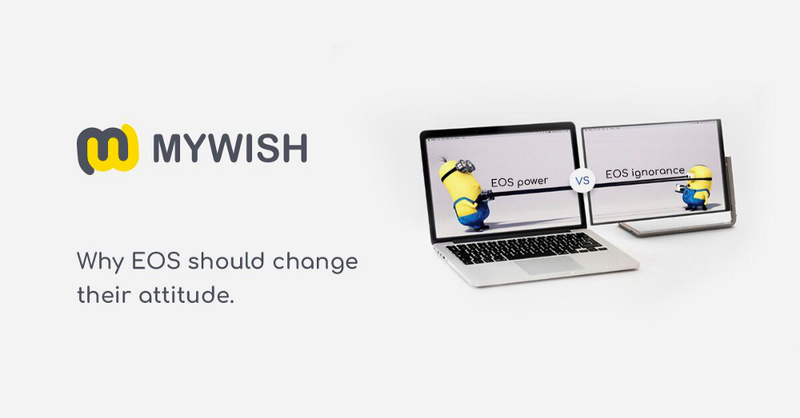 MyWish has become the first smart contract platform to createa secure smart contract service for EOS, so all developers have the chance to prosper no matter their chosen blockchain. MyWish currently supports several formats on the EOS blockchain: the Token Contract and the EOS account service. MyWish contracts are user-friendly and simple: you don’t need any coding skills to create them. As long as EOS team doesn’t step up to the place, MyWish is there to have your back. Create your first EOS smart contract today.